Are Sprint Cup and/or Nationwide races on the horizon for Eldora? 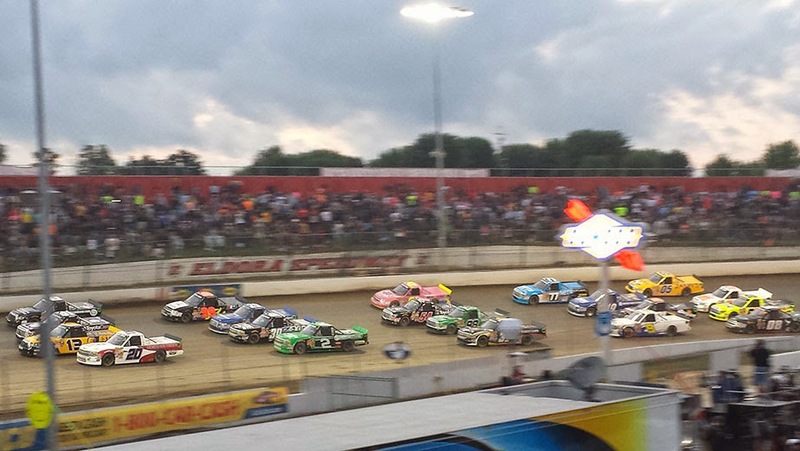 The NASCAR Camping World Truck Series returned once again to the legendary dirt track Eldora Speedway this Wednesday for the Mudsummer Classic and once again, it was a big success. The racing was excellent, there was a strong crowd and the ratings were very good as Darrell "Bubba" Wallace, Jr. was able to hold off Kyle Larson in a wild finish for the victory. So what is next for Eldora? Track owner Tony Stewart is interested in bringing Cup and Nationwide action to the track. Could that happen in the future? Cup races at Eldora do seem like a stretch, even as the upcoming TV contract has led NASCAR to ponder some changes to the schedule. The crowds have been strong for the truck race but Eldora only seats about 18,000, making it far and away the smallest capacity for a Cup race (next smallest: Watkins Glen at 41,000). It also is more or less in the middle of nowhere in rural western Ohio, situated about halfway between Indianapolis and Columbus. Factor that in with the fact that the purses for Mudsummer Classic are the lowest in the Truck Series and it seems like while it would be a wild race, it may not be all that practical of a decision right now, although an exhibition race could work. A Nationwide race, on the other hand, would make total sense. In fact, pairing a Nationwide and a Truck race at Eldora could help make it a bigger event that could carry a weekend, perhaps one in which the Cup series is on an off weekend. Or they could each be standalone races at different points in the year, and potentially both in the middle of the week, a scheduling decision that has been very successful for the Mudsummer Classic as well as the truck race at Bristol. It is clear that stock car racing on dirt has been very successful that far, but NASCAR cannot overdo it. For example, they can look to the NHL as an example with their outdoor games. The Winter Classic has been hugely successful and it has thus expanded it to a handful of games, their "Stadium Series." The expanded slate was a big success and has led the league to continue it. It appears that the league has successfully managed to expand the slate without inundating the market. Supply appears to be meeting the demand and NASCAR should consider dirt track racing to be similar.